It is firstly important to understand that many insurance companies unfortunately have been misguided in terms of what specifications to ask for in a padlock. But if you want a concise answer without reading on, then simply go for a padlock which is CEN Rated to 3 or more and ideally ‘closed shackle‘ if you can. This is usually a mistake. Padlocks are rarely made with levers any longer and often insurance companies are confusing the standards for doors locks with padlocks. What they meant to ask is a “5 pin padlock”. This basically means the lock has at least 5 spring loaded pins which lift up and down depending on the shape of your key. 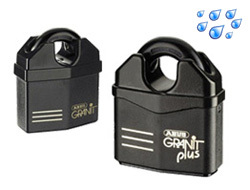 With 5 or more it makes the lock difficult to pick and therefore more secure (see image). That said, most locks above a reasonable size have 5 pins nowadays and this doesn’t meant they are especially secure. 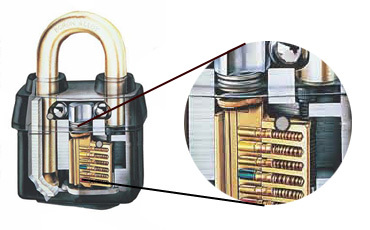 A poorly constructed lock with 5 pins can still be compromised within a seconds. 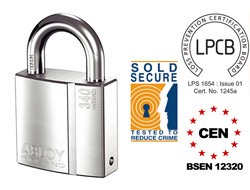 If you’re insurance company specifies this as a requirement we would recommend you still look to get yourself a CEN grade padlock for your own piece of mind. 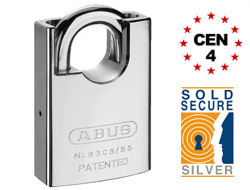 Any lock of CEN quality will have 5 or more pins and tick the box. Remember that only keyed padlocks can be regarded as “5 pins locks”. These are padlocks which have built up walls around the shackle and make it difficult for bolt cutters to compromise. 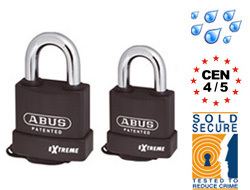 See our dedicated page on Closed Shackle Padlocks for more detail. The difficulty comes when defining a closed shackle lock since technically both circular discus locks and block shaped shutter padlocks are also closed shackle in design. If in doubt please refer your insurance company to this knowledge base to ensure they understand the true definition of a closed shackle lock. These are locks which are tested to specific requirements of European CEN grades. We have a specific page with details of these but basically you just need to look for the CEN kite mark on the lock. We place these kite marks on all product images which are application to make it very clear which grade applies to which lock. What is the BS EN12320 Grade? What is the CEN Grading System?